Merry Christmas from Creations for Charity 2013! The 5th annual Creations for Charity ended with over $20,000 worth of Lego sets donated to children in 6 cities across 3 countries. This year with the first time help of The LEGO Group and Bricklink, we far exceeded the amount of Lego we’ve ever donated in a single year. 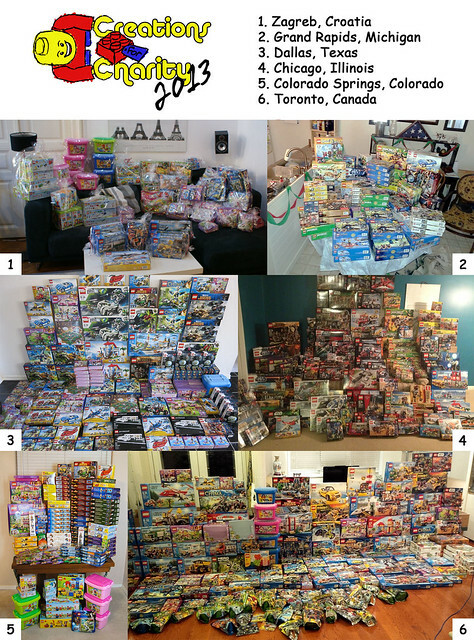 We sold over 100 custom creations and raised $8,600, and as usual our distribution coordinators found great deals and purchased as much Lego as possible with the money raised. Creations for Charity continues to embody the Lego community’s talent and spirit of giving back. The simple idea of builders selling their creations to raise money to buy Lego sets for underprivileged children has really taken off. As a builder, you experience the satisfaction knowing that someone will cherish and display the creation you assembled brick-by-brick. As a buyer, you felt the thrill of opening the package and setting that one-of-a-kind creation on your shelf. But most importantly, the kids are the ones who benefit the most – receiving a brand new Lego set that is likely their first one. Just the thought of the countless hours of play that these sets will bring is more than enough to brighten my holidays. Apart from the big picture, Creations for Charity is full of small stories. I can only imagine the selfless act of a 5 year old boy who gave all of his birthday presents to us to give to those who are less fortunate. I can only imagine the bittersweet feeling of a parent giving their kids their favorite Lego sets for Christmas when their home was destroyed by a fire. I can only imagine the warmth in the hearts of those who sat down with kids in an orphanage to build a new Lego set together. Of those stories we know, many more will never be told to us, but they are out there and they exist because of what we did. The future is bright for Creations for Charity. I am always happy to welcome new participants and volunteers and to see our donations grow. The efforts of so many people involved give me inspiration and joy, a gift I look forward to receiving each year. I am honored to be a part of such an amazing community.